Some mushroom people are pretty happy these days. The Mushroom Council and American Mushroom Institute share a small, single-story brick office a 10-minute drive from the official Mushroom Capital of the World, a.k.a., Kennett Square, where the fungi has a $1.1 billion impact on the commonwealth of Pennsylvania. The charming, old-timey town center marks the 50-square-mile region that produces about 60% of U.S.-grown mushrooms, and it’s where the Kennett Square Mushroom Festival happens, said Heather Harter, the council’s industry communications coordinator. To cap it off, that festival reached the $1 million milestone in charitable giving. Although the volume of sales of the 2017-18 U.S. mushroom crop dropped 2% to 917 million pounds from last season, the value of sales ticked up 1% to $1.23 billion, according to the August 2018 mushroom crop report, the most recent report released by the National Agricultural Statistics Service, Agricultural Statistics Board and U.S. Department of Agriculture. The average reported price was $1.34 per pound, up 3 cents from the previous year’s price. 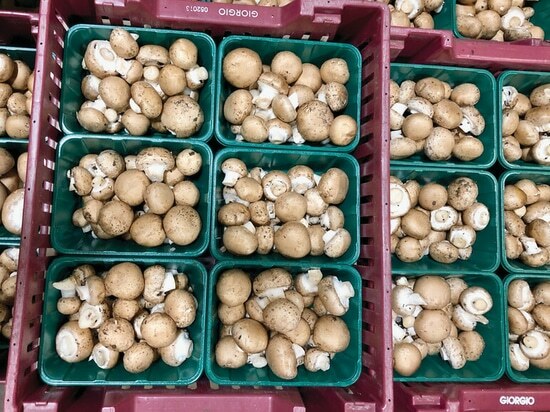 According to retail data from the IRI/Freshlook marketing research firm for the week ending Nov. 4, mushroom sales were up 6% over the prior 52 weeks, outpacing total produce, which was up 3.3% over the prior 52 weeks. Specialty mushrooms were up 19.5%, value-added fresh mushrooms rose 22.8% and criminis increased 8.8%. There are at least five phases of mushroom-making, but it all starts with the compost, said Joe D’Amico of To-Jo Mushrooms, Avondale, Pa., as he gave a tour of his family’s composting wharf, where steam billowed from some of the warm mounds. The compost goes through a lot of natural heating, soaking and aeration to grow microorganisms before it enters phase two, the pasteurization that kills the bad bacteria. To-Jo revamped its process by doing the pasteurization in a tunnel rather than in the grow houses, allowing the producers to rotate the houses’ crop 5.2 times a year rather than 4.7 times, a 10-week cycle rather than a 12-week one, D’Amico said. “As demand increases, we’re able to grow more mushrooms in the same number of houses so we don’t expand our footprint. And it’s more efficient,” said Peter Wilder, To-Jo’s marketing director. Employees hand-pick the harvest in the morning from the three- or six-level indoor growing beds, pack all day, and then To-Jo’s fleet of company-owned trucks departs in the evening. By expanding its growing capacity by 200,000 square feet in 2014, To-Jo added 8 million pounds of product annually. Over the past eight decades, the grower-shipper-wholesaler has diversified, adding its own brand, processed mushrooms and value-added products. What To-Jo can’t grow for its customers, it can source and ship. It also handles berries and avocados — anything that can fill the gaps inside the refrigerated trucks at the same temperature as mushrooms. At its 10 farms nationwide and in Mexico, Monterey Mushrooms, Watsonville, Calif., produces more than 250 million pounds of mushrooms, and 20 million pounds of that is organic white and brown button mushrooms, David Nesselrode, general manager of the Madisonville, Texas, farm, said in a 2016 video by the company. “Organic mushroom consumption is on the rise exponentially, driven by the millennials,” said Mike O’Brien, Monterey Mushroom’s vice president of sales and marketing. 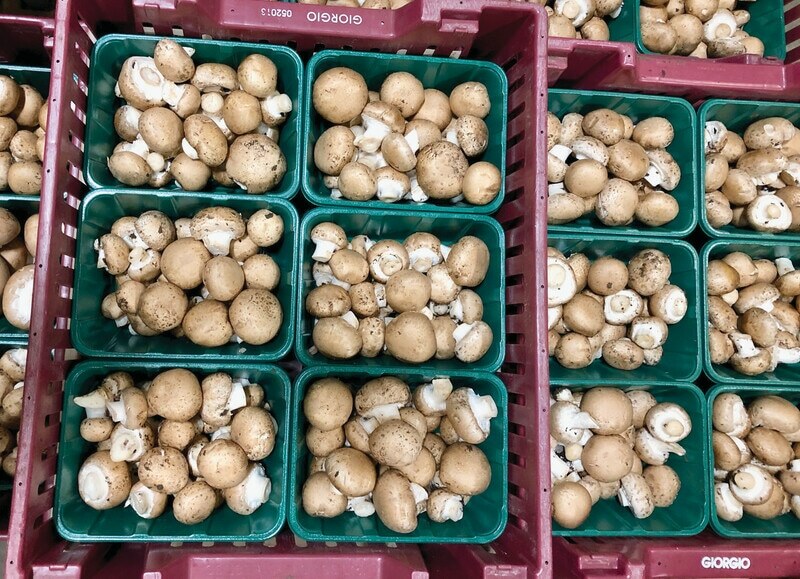 To satisfy the demand, Monterey Mushrooms is aggressively adjusting square footage from conventional to CCOF-certified organic mushrooms with the goal of being a one-source supplier for customers, O’Brien said. In the specialty category, Monterey Mushrooms has seen tremendous growth in shiitake mushrooms, O’Brien said. Ostrom Mushroom Farms, Olympia, Wash., had some ups and downs in the 2018 production year, said Fletcher Street, director of Ostrom marketing and sales. “But by the end of the year, we were experiencing strong, consistent production and expect to see that trend continue,” Street said. Giorgio Fresh Co., Blandon, Pa., is responding to the consumer demand for value packs and 16-ounce packs to feed large families, said Bill Litvin, vice president of sales. Giorgio refreshed its package design recently, color coding by segment and displaying the product names in larger type on the labels. “Consumers are looking for simplicity, and our new labels have a simple, clean design to them. We wanted to make it easier for the consumer to shop,” Litvin said.